Bike Sharing Schemes: How London Measures Up. – @Informal Blog for professionals Facility Management. When it comes to bike sharing schemes, China is way ahead of the competition. Chinese cities have enthusiastically embraced the concept and Wuhan’s system has an impressive 90,000 bikes in circulation. How does the rest of the world and London in particular measure up? Paris does have more bicycles in its sharing system than Beijing – 23,900 compared to 22,000. 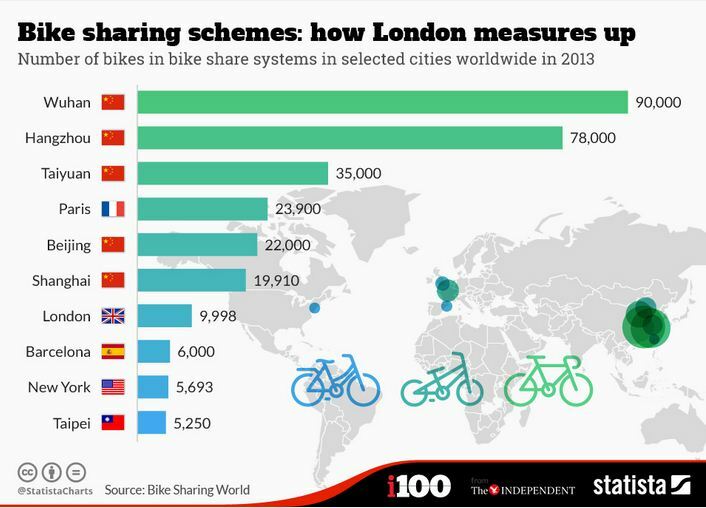 In comparison, London is some distance behind with just under 10,000 bikes. It is still a European heavyweight, however, ahead of Barcelona’s 6,000 bikes. London also has more bikes in circulation than both New York and Taipei.